Located near downtown Littleton, New Hampshire, 1,373 foot Eustis Hill served local skiers for decades prior to closing at some point circa the 1970s. A group of locals formed Mt. 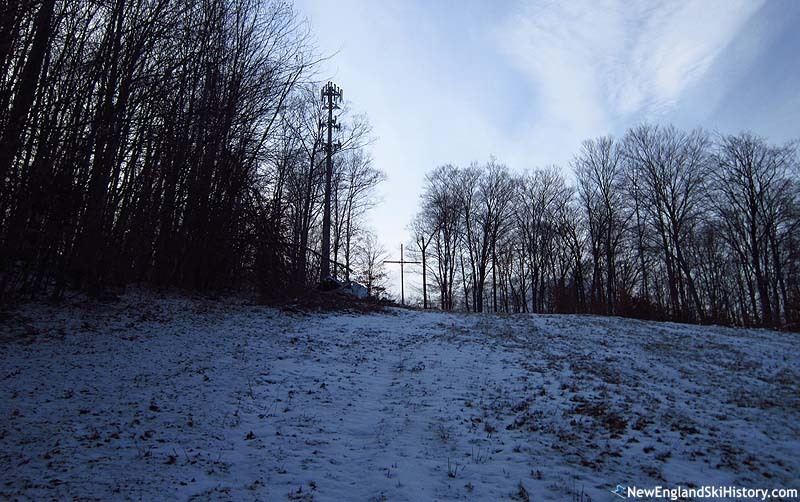 Eustis Ski Hill in 2012 and hope to reopen the area in 2013-14. Organized downhill skiing on Eustis Hill likely dates back to at least the 1937-38 season, when a novice-intermediate trail was cut, leading into open slopes. The Littleton Outing Club was likely involved. For the following season, Wilson Lewis set up a ski tow on the land purchased by his father from the Johnson dairy farm in 1902. The rope tow was dedicated by the Littleton Outing Club during the last weekend of January in 1939. 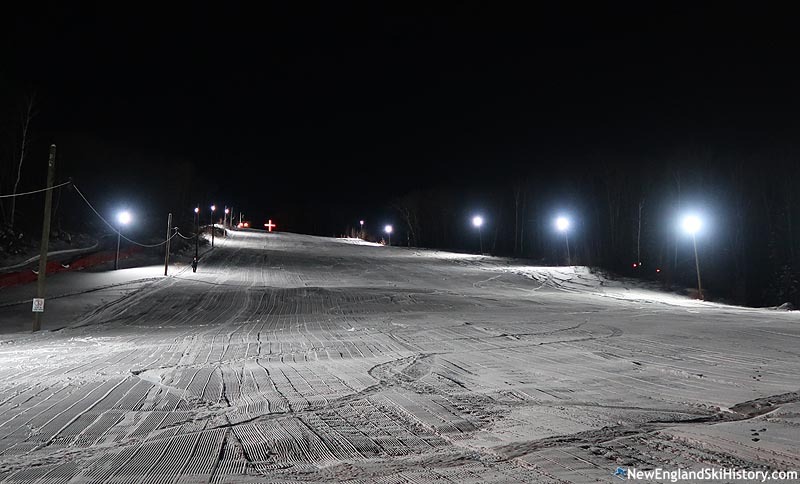 Lewis and co-operator C. Edward Magoon installed lights on the slope for the 1940-41 season, debuting the night skiing operation in mid January. Lewis sold the ski area to George Pepperell prior to the 1945-46 season, at which point it was likely operated by Mt. Eustis Ski Tows, Inc. During that time, the main slope offered "all sorts of dipsy-doos" served by a 1,600 foot rope tow. In addition, the Slaughter House Trail was advertised as being a "real fast runner" conveniently located near the Littleton Hospital. The area likely ceased operating around 1950, perhaps due to lack of natural snow. Mt. Eustis was advertised as reopening for the 1953-54 season, perhaps leased by the town. The town purchased the 35 acre property in 1960. At some point during the 1950s or 1960s, the bottom of the ski area was likely lost due to the construction of Interstate 93. Mt. Eustis likely closed as a lift served ski area in the 1970s. While there were attempts to reopen it, the ski area fell into a state of disrepair in subsequent decades. While the infrastructure rotted, locals still used the land for sledding, snowmobiling, and mountain biking. News of a potential reopening emerged in early 2012, as local business owners began organizing an entity to rebuild and reopen the ski area. Mt. Eustis Ski Hill was created as a New Hampshire Non Profit Corporation on October 25, 2012. On March 12, 2013, Littleton voters approved Article 26, leasing 33 town owned acres to the Mount Eustis Ski Hill group for $1 per year for three years. The former Lisbon rope tow was handed over to students of Littleton High School to rebuild, while Home Depot provided a new warming hut and Bretton Woods a snowcat. Mt. 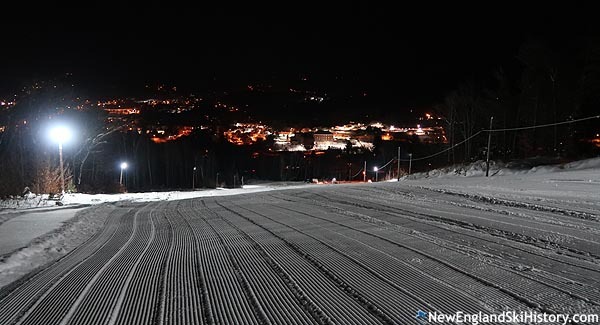 Eustis Ski Hill opened in mid February 2015 with the lower slope serviced by a short portable rope tow. A longer rope tow was installed in 2015-16, serving the entire main slope. "Its been along road sence the Mt Eustis Ski Hill board members organized to re-open,the amount of hoops we had to jump thru seemed endless just to get all the red tape issues in order, our last final hurble was to aquire our 501 C (3) status, which pretty much took a year, its been allmost a month and we finally have it in hand !Due to waiting on our non profit status our fund raising efforts had to be put on hold, but now we are putting a aggresive fund raising program together, to date we have gotten a lot done on the hill,in the next 2 months we plan on finishing the construction of the rope tow, lighting,warming hut for the first up comming season,a large local ski area has donated a groomer which is huge!We are behind the 8 ball in a way,but looks like the people of the region will help make sure we get give the best to re open this season after 40-years of being closed,and of course a lot of help from ma ma nature would help!Geof Lopus Mt Eustis Board Member"
"Our family lived on Grove Street, 'just down the road' from Mt Eustis, and we spent most of our winters skiing there. Hiking over for night skiing was fun when you're 11 or 12 years old! The warming hut was always full with frozen faces and wet mittens. The tow was an interesting piece of machinery; grabbing you quickly and pulling you to the top...God help you if you fell though, the patience level of many folks was about zero! Leather mittens were the norm, but by the end of the season they were practically rags, thank goodness for Saranac Glove! The camaraderie and friendships at Mt Eustis will always be a wonderful memory...thank you for bringing it back!"